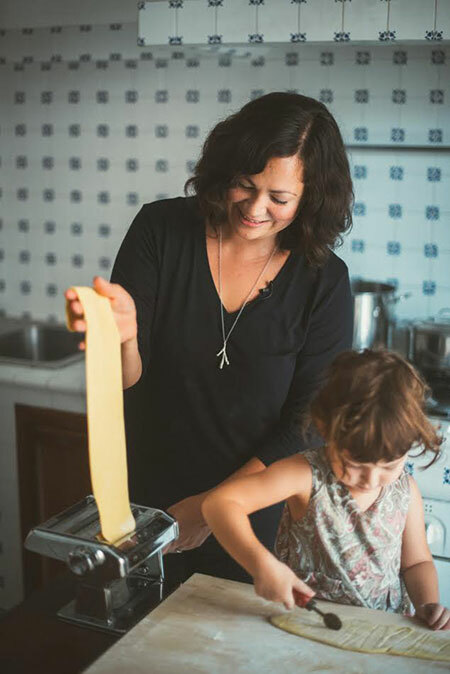 In celebration of World Pasta Day, Emiko Davies, author of the book “Florentine: The true cuisine of Florence”, talks exclusively with Tuscany Sweet Life about how the Florentine cuisine captured her heart, which pasta dish she would cook for this particular day, her cookbooks, and the origin of pasta. Furthermore, Emiko shares a traditional recipe for tomato sauce and gives some tips on how to cook the perfect pasta. A warm steaming bowl of spaghetti with tomato sauce and Parmigiano. Pasta with sea fruits, meat sauce or vegetables. Lasagna alla Bolognese, Tortellini, Ravioli, or Cannelloni filled with ricotta and spinach. Nothing says happiness in the Italian kitchen like a plate of pasta. Pasta is a typical Italian product and an integral part of Italian culture and society. There is no doubt about it that pasta is the number one dish to find its way to the Italian tables. Pasta has not only captured the hearts of the Italians but is consumed worldwide and has been embraced by many different cultures and people. Today, October 25th, we honor the noodle with World Pasta Day. This celebration of “The Queen of the Mediterranean diet” was brought into existence as part of the World Pasta Congress in Naples on October 25th in 1995, to promote the consumption and sustainable production of pasta. The best way to celebrate World Pasta Day is by cooking a delicious plate of your favorite pasta. 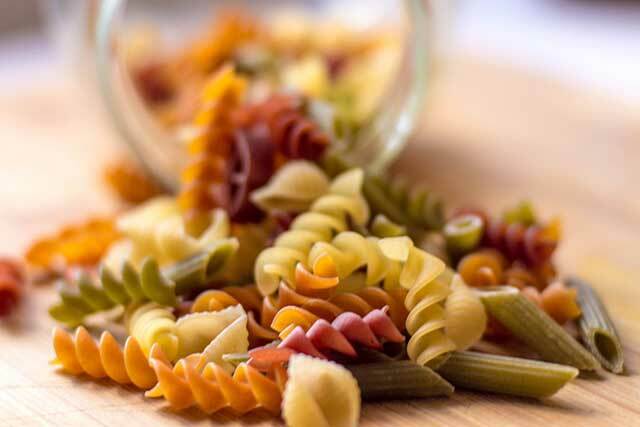 With over 600 shapes of pasta known to humankind, there is no limit to the number of different dishes you can create. We spoke with Florentine Food Writer Emiko Davies, who recently published her first cookbook about the traditional Florentine cuisine and is currently working on her second book. Davies, born in Australia from a Japanese mother and an Australian father, grew up partly in Beijing and studied Fine Art in Rhode Island. She moved to Florence some ten years ago, where she now lives with her Italian husband and daughter, in the hills overlooking the Renaissance city. She fell in love with Italy, Florence, and the local cuisine with all its traditions. Especially for World Pasta Day, she was so kind to make time in her busy schedule to chat with Tuscany Sweet Life about PASTA. You were born in Australia and traveled around quite a bit. How did you end up being a food blogger and photographer in Florence, with your first cookbook published and a second one on the way? I first came to Florence while I was studying a degree in Fine Art — I spent a few months in Florence studying etching and really fell in love with it. I came back again a few years later, in 2005, to study Art Restoration (paper and photography) and met my Tuscan husband. I’ve always loved food and cooking, but the food blog came much later. I was doing a lot of black and white film photography then but I realised that if I wanted to keep a blog going, I’d have to buy a digital camera and teach myself how to use it and how to edit photos on the laptop instead of in a darkroom. So I made the plunge and started the blog! The cookbook was a lucky break — I got contacted by a publisher in London via my blog and asked if I wanted to write a cookbook! I’m still pinching myself. You come from a very international background, and you must have tasted the most amazing dishes in exotic locations before settling in Florence. What was it about the Florentine cuisine that captured your heart in such a way that you wrote the book “Florentine: The True Cuisine of Florence“. It was the way that food is so traditional and has such a long history here — we don’t have that in Australia. It was immediately fascinating to me. Or how every trattoria has a similar menu and people go out to eat the same things their mamma or nonna cooks at home. Not only that, but the fact that when I first moved here it was really, really hard to find something good other than Tuscan food (things are slowly changing in Florence, finally!). This fascinated me even more. I lived in Beijing for 8 years where there, too, the cuisine is ancient and traditional, but it was amazing how cosmopolitan the city was even in the 90s when I was growing up there — it was easy to find a good dish of handmade gnocchi in an Italian restaurant in the Chinese capital but you couldn’t say the opposite here! I guess I found it noble and charmingly stubborn that Florentines have not deviated from their favourite food for centuries. I guess I found it noble and charmingly stubborn that Florentines have not deviated from their favourite food for centuries. In your cookbook and on your blog, you mention some typical pasta dishes from Florence and Tuscany. Which pasta dish would you cook for World Pasta Day and can you tell us a bit about the ingredients and the history of the plate? I would go really classic. Really simple. And cook pasta al pomodoro. It’s one of those dishes that illustrates what I’ve just mentioned about Florentines eating the same thing at their favourite trattorias that they would also eat at home. Children and adults alike love it. Pasta al pomodoro is the favourite comfort food of my husband. It’s what he craves at least once a week! And it’s something you’ll find always on a menu. 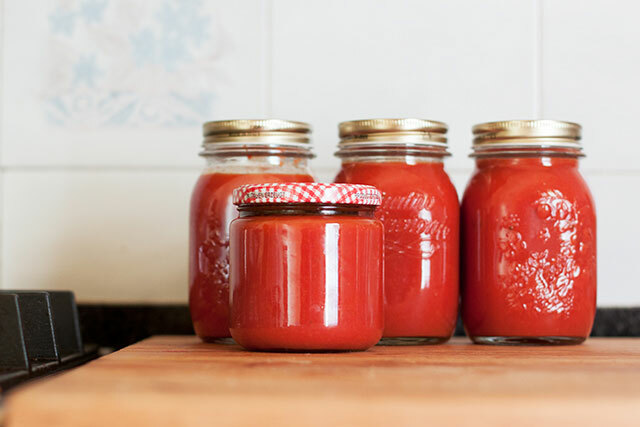 There are many different approaches to making this simple dish — there’s nothing like it when ripe tomatoes are available — but I’d make it the way that my husband’s nonna Lina used to do it, with her pomarola, fresh tomato sauce made in the summer with ripe tomatoes and a soffritto of onion, carrot and celery. She’d toss the sauce with al dente spaghetti or penne pasta with a knob of butter. Learn how to make Nonna Lina’s pomarola with the recipe on Emiko Davies’ food blog. Italian cooking is very traditional and bound to strict rules about what you can put on your pasta and what not. Do you ever break free from the pasta tradition and cook something wild and unexpected that your Italian family would frown upon? Not really. My family are pretty open to trying anything I cook — they trust me! But also I like to stick to traditional flavour combinations and sauces — there’s often a good reason for them, sometimes it’s location, poverty, seasonality, that dictates what these are, and sometimes it’s even simply out of respect for traditions. Your new book in the making “Acquacotta” talks about the local cuisine of another Tuscan area: The Maremma. What is the pasta culture like in a region as diverse as the Maremma with its long coastline, green hills, marshlands, cattle farms and agriculture? Well the most famous pasta of Maremma is undoubtedly Tortelli Maremmani, which are oversized, square ravioli (not, confusingly, at all like the tortellini of Emilia-Romagna) are filled with ricotta and spinach and usually dressed in a rich, hearty Maremman-style ragu. In the mountains, you can find pasta served with wild mushrooms and wild boar. But go to the coast and down to the lagoon-city of Orbetello and there they have spaghetti tossed with a good grating of the local bottarga and lemon juice. See the recipe for Spaghetti alla bottarga di Orbetello. You would assume that everybody knows how to cook pasta. Until that moment when you see your non-Italian friend add olive oil to the boiling water. Can you give us some tips on how to cook the perfect pasta? Pay attention to the timing because overcooked pasta is just intolerable for an Italian (tip — check it a few minutes before the recommended time on the packet and I usually take it out one minute before that recommended time too, especially if I’m tossing the pasta with a sauce right in the pan). But just as important as not overcooking the pasta is to salt the water properly. This is something that I admit took me a long time to realise — years really! But you only need to forget to put salt in the water once and you will realise how important that salt is. No matter what you do to the sauce, it will taste bland! Salt the water with a teaspoon of salt for every litre. There are various theories about the origin of pasta. The Italians, of course, claim that it was their idea, but so do the Chinese. According to Emiko Davies who first invented the pasta? It was both. Asian noodles and Italian pasta have a lot of similarities but I believe they were both born out of their own accord and their own unique cultures. I have discovered, living in so many different cultures my whole life, how small the world is and how there are some incredible similarities between cultures that are a world apart. 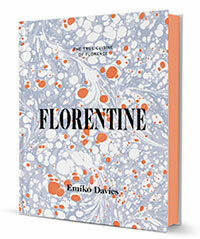 The book “Florentine: The true cuisine of Florence” by Emiko Davies is available on Amazon.com. Florentine is a collection of delicious recipes and stunning photographs from Tuscany’s capital. Emiko Davies draws on her personal experience of traditional Florentine cuisine to share recipes that transport readers to the piazzas of Florence.